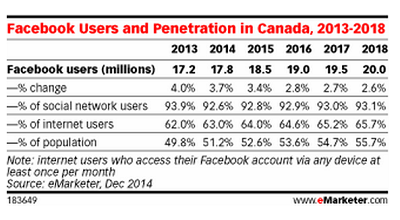 Canadians are known for being power users on the web and in consuming video content. So much so, in fact, that we may be reaching the saturation point in our use of social media platforms. For both Facebook and Twitter, the slow increase in user penetration that we’ve seen over the past few years should start dropping off, according to research released last week by eMarketer. And while both Facebook and Twitter face a gradual decline, it’s Facebook that’s set to see its numbers plateau earlier. Judging by these numbers, it might be easy to assume our social media usage is on a downward slide – but these drop-offs in user growth are probably just due to the number of Canadians who have already signed up for Facebook and Twitter accounts. If enough of the population is already on these social networks, there isn’t much space for those networks to grow, says Paul Briggs, eMarketer’s analyst for Canada. “I don’t think it’s too surprising. I think social networking has just reached a saturation point to some degree, especially on Facebook. That’s why you see the Facebook numbers plateauing more so than the Twitter numbers. Twitter’s obviously growing from a smaller penetration level in Canada, and that’s why you’re still seeing double-digit growth,” Briggs says, adding Facebook’s also more mature than Twitter in its lifespan and in some of its strategies for growth. 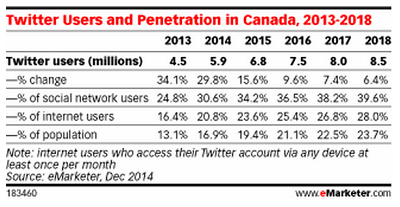 For Briggs, what’s particularly interesting about Canada is our usage of Twitter. Compared to the U.S., our penetration in terms of monthly active users is substantially higher, and considering the learning curve in using Twitter – for example, understanding how to read tweets appearing “a mile a minute” – it’s notable so many Canadians have embraced the platform. In 2014, the number of monthly active users in the U.S. was slated to grow by only 11.6 per cent, compared to 29.8 per cent here, according to eMarketer’s most recent numbers. A lot of the credit goes to Kirstine Stewart, the head of Twitter Canada and former vice-president of English language services for the CBC. By hiring media luminaries like Steve Ladurantaye, a former media reporter for the Globe and Mail, the team at Twitter Canada has been quick to build up its profile here, Briggs says. Briggs also credits Twitter’s success in Canada to the number of journalists and news outlets actively using the platform to disseminate news coverage, with Twitter being a popular vehicle to catch news as it breaks. However, he says he isn’t sure why that penetration is not higher among U.S. users, where many American news outlets and reporters are heavy Twitter users, often garnering a large following worldwide. Ontario legal deadlines are nearing for accessible communications - are your documents ready?